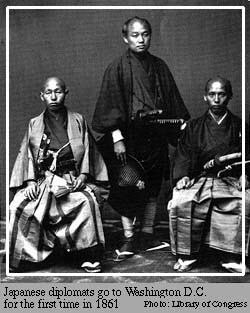 In the 1860s the ruling shogun was overthrown, and a 15-year-old emperor named Mutsuhito took the throne. He chose the name Meiji, meaning enlightened reign, for his rule. Meiji's supporters' slogan was "rich country, strong military." In the 45 years of Emperor Mutsuhito's reign, Japan went a long way toward achieving both goals. By the end of the nineteenth century the nation had a new political system with a parliament and a constitution, a modern army and navy, and growing industries. The new Japan understood that being a strong and prosperous nation was the only way to preserve its independence and unique culture. European nations had seized huge territories all across Asia, which they ruled as colonies. The once-mighty empire of China was forced to offer European powers special trade privileges. Japan's rulers were determined to keep their country from becoming a colony of the West. The best way to do this, they believed, was to adopt Western culture and technology and to make Japan strong. Why do you think Japan went so quickly from being an isolated country to suddenly wanting to be modern, rich, and strong? Were the times different? Was Japan warned about imperialists? Seize - to grab or take hold of something suddenly.